We already knew that lightning would strike again with Halle Berry back as Storm, despite recent news of the actress becoming pregnant, and now we have a photo of the weather controlling mutant's new look in X-Men: Days of Future Past. Director Bryan Singer has posted a few photos on Twitter of the cast here and there, including concept art of Beast. This is the first photo that actually shows some new wardrobe really well, and gives us a decent glimpse of a character's new look. It looks like this is from a photoshoot (as with other recent pictures from Singer's Twitter) that will likely be used for a poster campaign. Look below! X-Men: Days of Future Past is directed by Bryan Singer and written by Matthew Vaughn and Simon Kinberg. The sequel features cast members from the original X-Men franchise like Hugh Jackman, Patrick Stewart, Ian McKellen, Halle Berry, Anna Paquin, Ellen Page, Shawn Ashmore and Daniel Cudmore along with X-Men: First Class cast members like James McAvoy, Jennifer Lawrence, Nicholas Hoult, and Michael Fassbender. New cast members include Omar Sy, Peter Dinklage, Fan Bingbing and Boo Boo Stewart. It's a crowded cast, so stay tuned for any further updates, especially from Bryan Singer, as the film progresses. 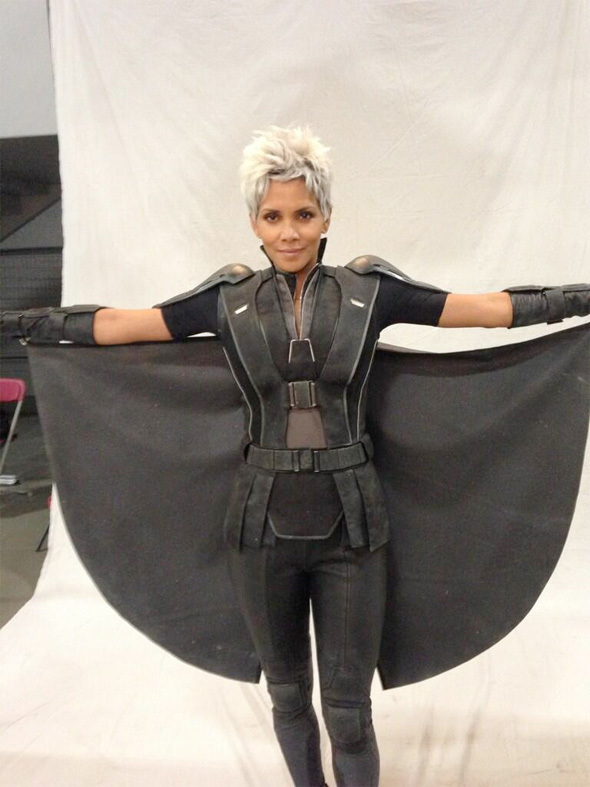 this just in: Halle Berry cosplay mistaken for real Storm costume in Bryan Singer's new X-men movie. This has to be considered as the official movie poster. I agree, would make a fantastic poster. Only we don't know if it's Kitty Pryde who travels back(like in the original comics) or Bishop (cartoon, maybe some alt. comics) in this adaption? Bishop would be cool but being black, he would die first unfortunately. First of all, JOHN BYRNE needs to get some respect from the studio for playing a massive role in creating this story and cover 34 years ago. I remember seeing it as a kid and deciding to become an artist. Love his work till this day. Anyone have any idea why I've been unable to view any pictures or posters on my computer? Only for this website though, its really annoying. Ideas, suggestions? Yes, I absolutely agree with you it is annoying but if you use Firefox or Chrome then you should be fine. For some reason these guys decided to use some kind of 'revolutionary' image format, that I've never witnessed on any other site, that compresses pictures to the smallest bit while keeping the quality intact. Unfortunately, this is not a format that any version of internet explorer supports especially in version 10. Damn. Thank you for the info. I wish I could give a clear answer, it might be that Firstshowing has up to 25 scripts(!) running on a page; a lot of companies wanting to collect your info. I've encountered this problem on every browser with this site(and only this site? ), try adjusting your settings or not from a public or work computer. ...and that's why i love firefox and all the great add-ons which block that sh*t..
if you're letting it go - why post a comment about it?....you kids and your comic books. This looks really stupid. It's like it's some kind of superhero outfit or something. I think she had the best hair style in X-Men 2. Looks like my grandmother in a costume.